Last year, my co-worker Rob had his first baby, an adorable little girl named Melina. For the occasion I decided to make her a sweater. I'd never made a sweater before, mainly because knitting an adult sweater seemed too time consuming to be worth the effort. 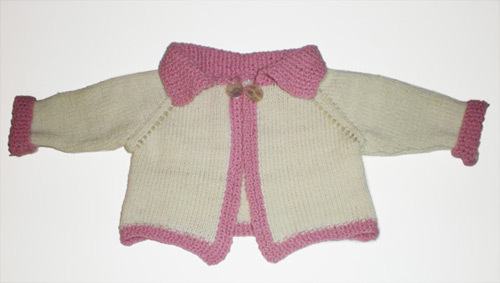 A baby sweater on the other hand is cute and tiny and goes relatively quickly. I used this pattern here, with some changes of course. I made it out of a cotton/acrylic blended yarn so it can stand up to some washings. 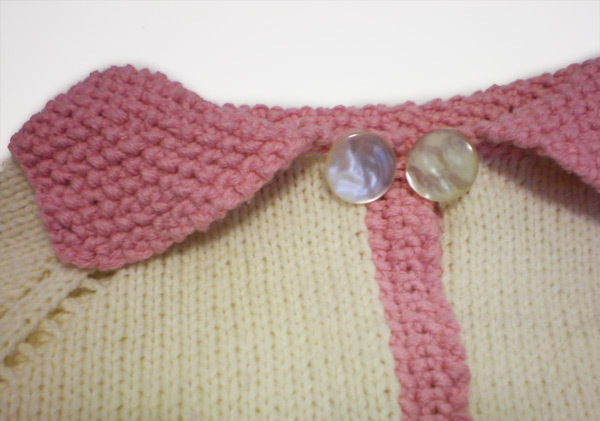 The pattern calls for the closure to be string ties, but since babies and strings don't go well, I made it a button and loop closure. The second button is just decorative to make it symmetrical. 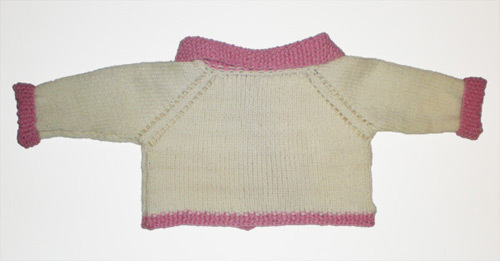 After the success and ease of making a tiny sweater, I will totally make more baby sweaters and I just might attempt one for an adult. I have a bunch of patterns from the 60's that are very tempting.